Although the dangers of car accidents are well known, the risk of being involved in a road accident as a pedestrian are not as often considered. Unfortunately, pedestrians can be at more risk in serious accidents as they are not as protected as drivers. It is estimated that every year around 30,000 pedestrians are caught in traffic accidents, which can result in injuries ranging from minor bruises to fatalities. In an accident in which a pedestrian is injured or killed it can sometimes be difficult to assess who is to blame for the accident occurring. 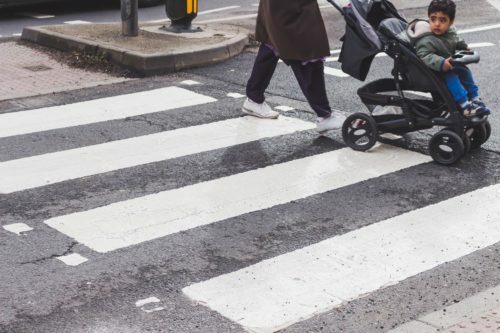 In the circumstance that you are hurt after a car mounted the pavement, or if the car failed to stop at a pedestrian crossing, you will have strong grounds to make a claim, as it is highly likely that accidents like these would be the driver’s fault. If you crossed a road somewhere that was not a pedestrian crossing, it can sometimes be more complex. For example, if you were to cross the road between two parked cars, it could be said that it is your fault rather than the driver’s fault, as you did not cross in a visible location. Another situation you can make a claim is if you find yourself in a situation whilst walking on the pavement where you have to jump out of the way of a crash. Even if the vehicle did not hit you, you may still have a strong basis to make a claim for any injuries you suffered due to avoiding the crash. Do I have grounds to make a claim? A compensation claim can be made against any driver that you think caused the accident which lead to your, or your loved one’s injury. In pedestrian road accidents, blame can often rest with the driver due to reckless driving (which can be drink or drug related). The success of the claim can be dependent on many factors, however two big factors are whether you can prove you suffered an injury and whether you can prove that the driver was driving in a reckless manner or in a way that was not considerate to the safety of pedestrians. If you find yourself in a roadside accident as a pedestrian, it is crucial to contact the ambulance service straightaway so you can get any treatment you might need. You should also contact the police so that they can properly record the events of the incident. These records will essential to help build a strong case in the future. The prospect of starting the claim process can be daunting, especially if you are recovering from injuries. The first step is to contact a personal injury lawyer that specialises in such cases. Smooth Law have decades of experience in dealing with roadside and pedestrian accidents. Our lawyers are also members of APIL (Association of Personal Injury Lawyers). Contact us today to get advice about your pedestrian accident claim by calling 08001615709.